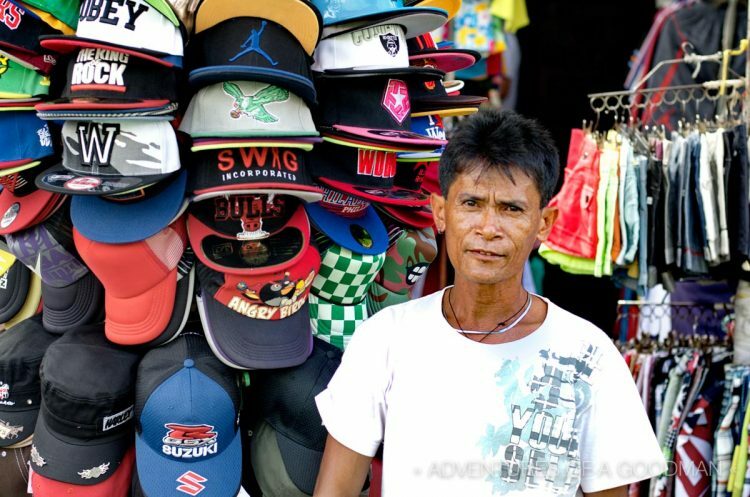 It seems that everywhere I go in Manila, Philippines, there’s a smiling person who wants me to take their photograph. After wandering around the Barclaran Market and visiting the nearby church, Carrie and I stopped at a local eatery for lunch. The staff acted as if they had never served a Westerner before; though, I have to imagine they are just as friendly with everyone who sits down. Regardless, after devouring a plate of porkclog, which can only be described as deliciously-flavored and fried pork chops, I asked the Filipino guys behind the counter to smile for a photo. How long can I hold my hand relatively-still while bumping around in a small cart attached to a motorcycle. That’s what I asked myself as I took this photograph at ISO 800 with a shutter speed of .625/s and an aperture of f/3.5. Out of the dozen I shot, this was by far my favorite. I had just finished making a similar photo of this De La Salle University building when Carrie informed me that the security guard to my right had struck a pose when he saw me take the photo. Thank goodness she told me, because the photo became far more interesting when he repeated that pose for my camera. Have you ever visited Manila or the Philippines? I would love to hear about your experiences with the locals.